Chairman of the so-called Southern Interim Council (SIC) accused on Thursday the Islah Party of postponing decisive military factory in the Yemeni war raged more than three years and a half ago against Houthis. 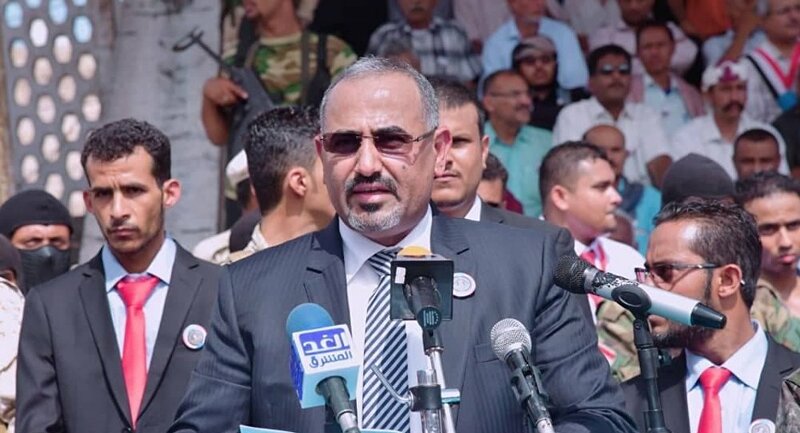 "It is time to stop warlords and hold them accountable for exploiting war in Yemen and their actions that delayed factory to serve their own interests," Aidaroos al-Zobaidi said at the anniversary of First Infantry Brigade establishment in Aden. "We should correct compass to complete liberation of rest of this land, and let the project of Iran and of terrorism and extremism be buried forever." He hailed "combatants fighting in honor fields in defense of Arab project led by Saudi Arabia and United Arab Emirates... You raised name of the South highly and rebelled the occupier from our country after two decades." The UAE-supported SIC consists of Yemeni southern bodies calling for separation from the North Yemen and restoration of south state that existed before Yemeni Unification in 1990. The Council, however, is not fully supported by southerners. Mr. Zobaidi was Aden governor, before Yemeni President Hadi sacked him on 27 April, 2017, leading him to announce establishment of SIC on 11 May of the same year. SIC leader claimed that his council's and southern resistance troops, backed by Arab coalition, are raging real war against Houthis and terrorist organizations, namely ISIS and Qaida affiliates in Yemen. The Council "is committed to continuing this war till factory, embodied by achieving objectives of Decisive Storm and Hope Restoration, as well as our national fair goals." It should be noted that Hadi government denied the SIC establishment at the time, citing that it would deepen disputes and serve Houthi interests. The Council militarily controls large swathes of Aden, and it led last January a failed coup against the Yemeni legitimate government. Another SIC leader, Lotfi Shatara, on Wednesday, snared at those saying that south secession would lead to fighting between southerners, since "the Council, in its leadership, contains all southern governorates and southerners are more united than ever. In interview with the UAE 'ERM News' website, the southern political activist cited "two reasons that delayed factory against Houthis; first is army of the internationally recognized Yemeni government, second is treasons by Islah Party... that hindered factory in many fronts, such as in Taiz and Bayda, by preventing its elements from participation in battles and smuggling arms to Houthis. "The Party kidnapped the government and dominated its decisions impeding development and stability in the south." Islah, the Muslim Brethren offshoot in Yemen, has faced recently many accusations and it is continually criticized on press and social media for its "suspicious" role in military operations. Yemen has been racked by armed conflict which broke out after the Iran-backed Houthis had ousted the internationally recognized government in late 2014. The conflict escalated after a Saudi-led military coalition intervened militarily in the country in March 2015, and has left nearly 16,000 people dead, hundreds of thousands injured, 3 million displaced and made other thousands to flee the country.